Celebration time for Paul Leeman (left) and Kieran Harding of the Glentoran backroom team following Saturday's success against Newry City AFC. Pic by Pacemaker. Manager Gary Smyth saluted the contribution of versatile Robbie McDaid after Glentoran’s tension-riddled victory over Newry City AFC at the Oval. The East Belfast boys hadn’t won in front of home fans since October 27, so it was hardly surprising there were a lot of raw nerve-ends on show, both on and off the pitch. And, just to heap on a little added pressure, Smyth was taking charge for the first time in front of home fans after replacing Ronnie McFall. Battling Newry City certainly showed little mercy because they surged into the lead just before the half-time whistle as James Walker’s 18-yard drive exploded into the top corner, leaving Elliott Morris as a mere spectator. Suddenly, the gloom that had lingered over the aging Belfast venue for much of the season once again began to hover. Instead, Smyth’s half-time words of wisdom worked a treat - his boys were back in business when the industrious McDaid took off on a darting right-wing run, before looping the ball to the back post for new signing Darren Murray to flick home his first goal for the club. And, with the clock ticking down, McDaid gobbled up a cute flick from Lukas Gwiazda before drilling in another low cross that defender Darren King attempted to hoof clear but only succeeded in blasting the ball into his own net, off goalkeeper Andy Coleman. “It was a massive three points,” beamed Smyth. “We were a bit shell-shocked at the interval, they scored with their only shot on target – it came out of nowhere. “It was a time for cool heads, it was important not to panic. “Robbie tormented Newry all day – he was on fire, we’ve given him a licence to roam, rather than sticking him up front. “He caused them trouble on the right, on the left and through the middle – I was thrilled with his performance, he appears to be revelling in that little role. “Robbie’s the quickest player in our team, his pace will scare people, he is good in the air, he’s direct, he can play on the left or the right. “We were also a lot more solid at the back, Joe Crowe and Calum Birney were immense. “The boys were disappointed they didn’t get a clean sheet, but the Newry goal was just one you have to admire – they’ll not get one like that again for a long time. 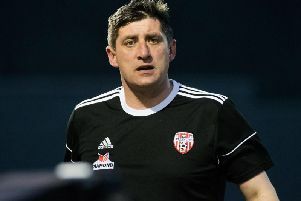 “With Warrenpoint Town and Dungannon Swifts both winning, we could have found ourselves even further down the table if we hadn’t picked up full points. City boss Darren Mullen insists his boys must start putting points on the board if they are to escape the threat of relegation. “I reckon our performance deserved something from the game,” he said. “We started the game well and got ourselves into a good position, with a super goal from Jimmy. “The message for the second half was to manage the game because we knew they would come at us, but we didn’t do that and we paid the price for it. “We were exposed for their equaliser. We never cut out the cross and the boy (Murray) got free at the back post. “Then, to be beaten by an own goal was the ultimate punishment, it was disastrous, it just summed up our lack of luck. “It was a tough one to take, we have only ourselves to blame. “I thought it was a good opportunity for us to come here and get something. We are now in a dogfight at the bottom. GLENTORAN: Morris, Birney, Gallagher (Herron, 70), Allen, McDaid, Kerr, Pepper, Crowe, Redman, Murray (O’Neill, 80), Gwiazda. subs (not used): Garrett, Kane, Nelson, Gordon, McCarthy, O’Neill. subs (not used): Maguire, Delaney, Mullen, Durnin.